Creating a Wordle (word cloud) out of my resume really whittled it down to the essence of my academic and professional experience so far. 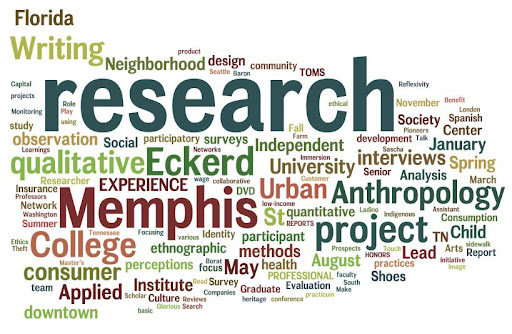 To create the image, I selected all of the text within my resume and pasted it into the Wordle app. Then I messed around a bit with the layout, font style and colors. It’s neat to see what words come up most often (the larger the size of the word, the more frequently it occurred in the text). Pretty much everything I’ve done has been research based in anthropology and qualitative methods, in both non-profit and community settings. Both of the colleges I’ve attended are also prominently featured. Of course, there were lots of projects and writing involved.